With the support of the Creative Europe Programme - MEDIA of the European Union. Victor is trapped in the wrong life – he just doesn’t know it yet. The pragmatic engineer in his late thirties believes that divorcing his wife Julia was a blessing and that the acute hearing loss he suffers from is not, in fact, a stress symptom. He is certain that his work as an aircraft technician suits his personality and that working with test pilot Richard is “just fine,” even though Richard is now his ex-wife’s new lover. As a child, Victor had been quite different. He was imaginative, musical and creative; all characteristics his mother managed to cure him of. It was she who forbade him to talk to Little King December, the peculiar creature who had affectionately accompanied young Victor up until then. Victor was forced to say a tearful goodbye to his imaginary companion. The exact same Little King December, the size of a pencil, wearing a crown and a purple coat, reappears to the adult Victor. Even though Victor tries to ignore him, the king stays and causes him to realize that he should try to win his wife back. 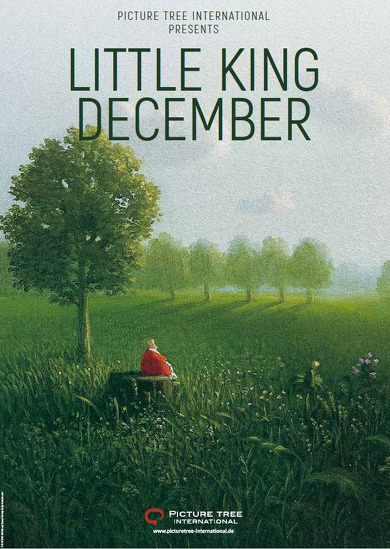 December coaxes him into visiting his “kings’ land” – a fantasy land inhabited only by kings like him. Following a first visit to this “king’s land”, rumors about Victor’s sanity begin to circulate at his company and he loses his job. Victor is devastated. He wants nothing to do with the world anymore and seeks refuge with the little king in the kings’ land. While there, he discovers a number of skills he didn’t even know he had. Victor eventually returns to the real world and almost manages to win Julia back; that is, until it dawns on him that it’s not about reconciling with her, but instead about finding himself.